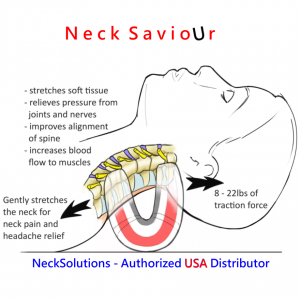 If you are experiencing neck pain and are tired of using hot packs and ointments that provide temporary relief, the Neck Savior Mini may be the solution you are looking for. The same versatile form of neck stretcher in a slightly smaller, easier to use model that provides decompression to the cervical spine. Just bend and place behind your neck. 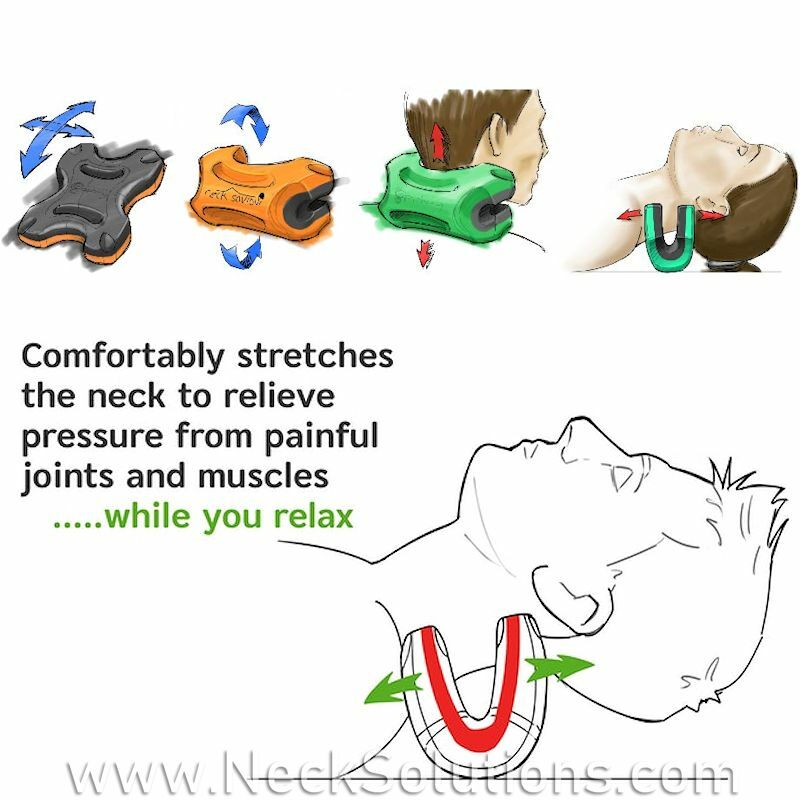 The force of the pressure to straighten offers a great way to stretch your neck. 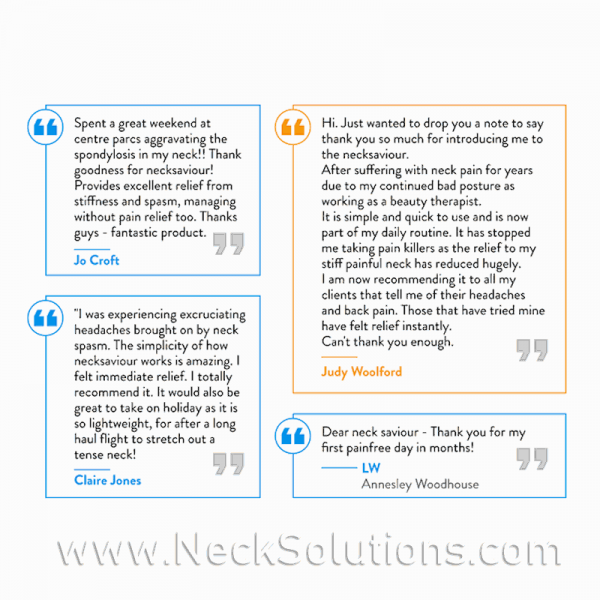 As exposed to sitting down at work and using computerized technology is more prevalent in society, neck problems are increasing. Postural strain can result in neck pain and headaches and, over a period of time, can lead to degenerative problems with discs and joints. Fortunately, the new mini offers help to reverse such painful symptoms. 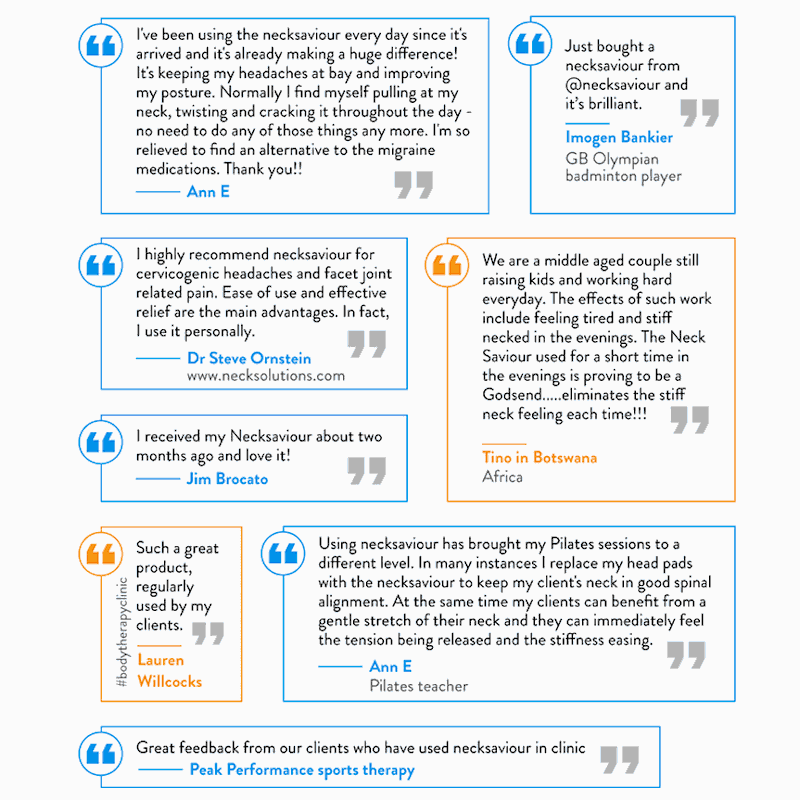 With consistent use, you may see a positive change in overall posture, spinal alignment, and improved joint and nerve health. To better understand how these improvements can be achieved. It has been meticulously designed by a Physiotherapist with many years experience and is a personal friend. I still have my original and use it after all these years. The Mini does not disappoint. Although the original has different options, I have my favorite and it has broken in nicely and fits like a glove. The mini gives you two options for stronger or lighter force. I would suggest using the lighter force to start. At first, you can squeeze between your legs to assist and it does take some force to bend, but not a lot. With consistent use, it will get easier, but there needs to be enough force to provide the opposing decompression. 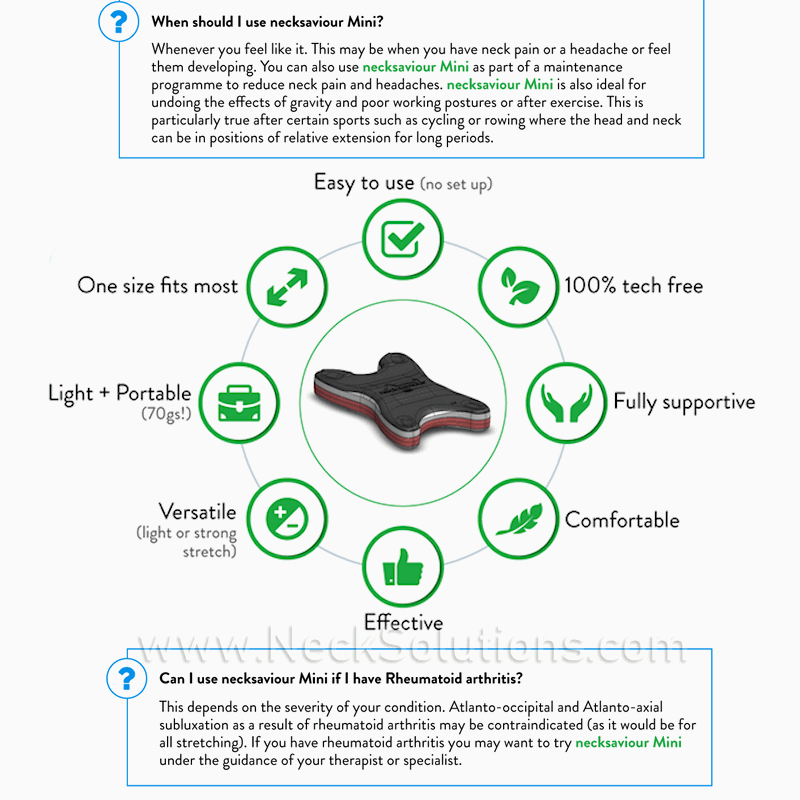 The quality of the materials is the same and they are very high quality. So, my original is easier to bend than a new one, but stick with it and you will have a neck stretcher that will last for years. If you have bad arthritis in your hands or very weak hand muscles, it may be difficult, however, other options require numerous pumping of inflation bulbs or lifting a heavy water bag. Yet other options that apply an effective distraction force are expensive and are not lightweight and easy to move around. The Mini version is not harder to bend than the standard version. Once it is broken in, it is very easy to use and I really like mine…. it actually is like fine wine, it gets better with age. So, at first, bend it a few times back and forth a few times before use. 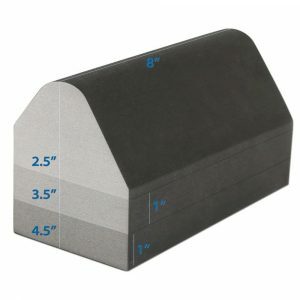 It is very lightweight, weighing only 75 grams, making it easy to handle and very portable for use anywhere. 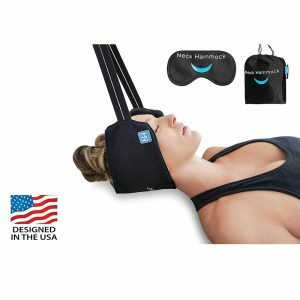 It is often used by Yoga and Pilates instructors for increased relaxation, reducing postural strain and assisting structural alignment. 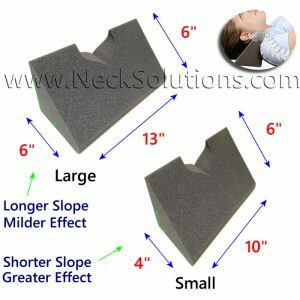 It uses multiple layers of special tensioning polyethylene foam, which is then folded to increase tension, then allowed to open under the neck, producing a stretching effect in the lower range of medical traction. On either side is an anatomically designed cut-out for the neck and top of the shoulders. 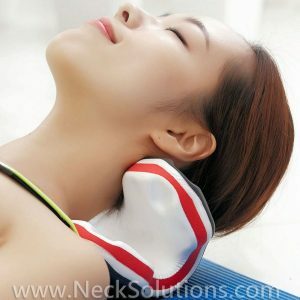 By adjusting your position while lying on the neck savior mini, you can find your own personal sweet spot. Additionally, by using motion against the pressure points, you can achieve massage or pressure point therapy as well. This is one of my favorite ways to use it; stretching with rotating pressure to the points at the base of the skull. It is color coordinated with the darker side producing a stronger stretch, where the lighter side helps achieve a lighter stretch. This gives you 2 stretch options (the standard has 4). 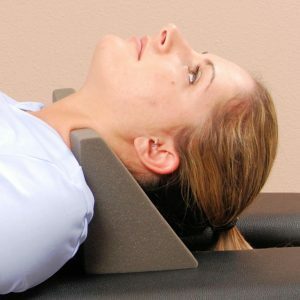 By applying decompression to the cervical spine, it is possible to experience reduced neck pain, stiffness, and neck related headaches. The Mini can help increase blood flow and the general recommendation is use up to three times per day for 15 to 20 minutes each. 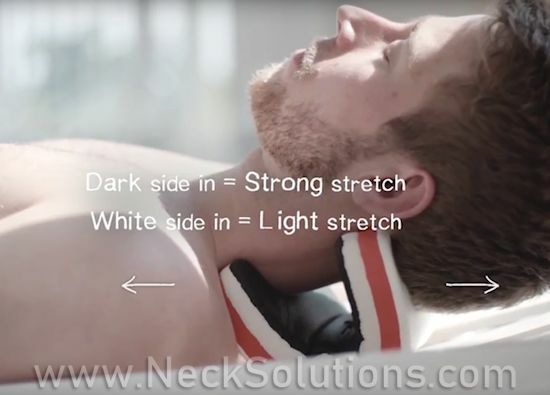 It is best used laying down as this reduces the force needed to achieve proper decompression, allowing gravity to work with increasing traction and increasing pressure point therapy techniques with motion. 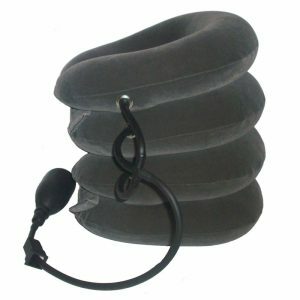 This promotes a more active therapeutic session to help increase range of motion and reduce pain. It can be used while reclining, although the base surface may vary along with reduced stretching.